SpotCrime mashes up police reports (according to TechCrunch, 90% of the data is scraped this way) with Google Maps to provide crime maps for various cities. Users can filter by date, type of crime or time of day. 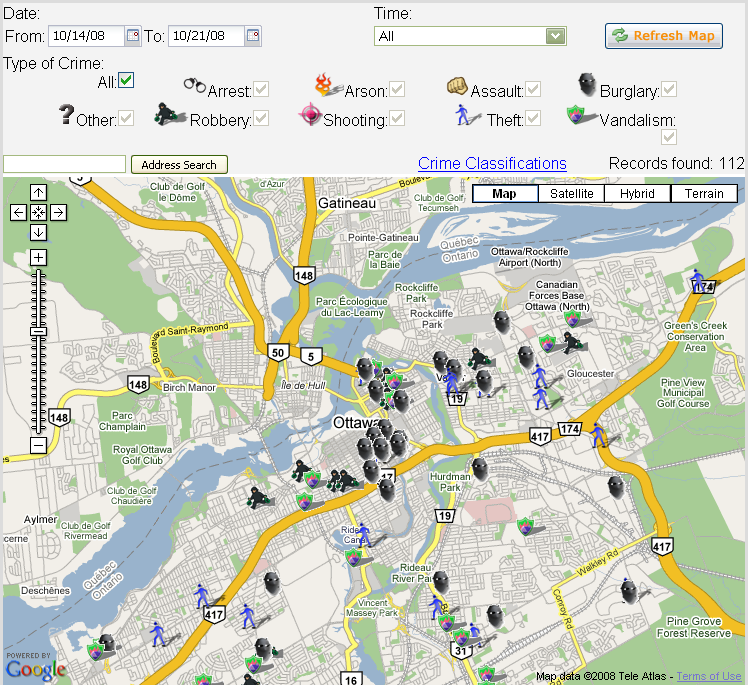 Above screen shot is the Ottawa map – here’s SpotCrime’s Ottawa site. Looks like over the last 2 months it’s all about vandalism, theft, and breaking and entering. Very different from Toronto’s profile, which appears to be much more about face to face confrontation — assault, robbery and a few shootings for good measure. Many other major Canadian cities are included as well – see the list. SpotCrime also allows users to click on the map icons to get additional detail on each incident and a link to the source data – every one that I clicked through pointed me to a police report of some sort. Users can also sign up for crime alerts or report a crime. Not sure how this last bit works – how is the info vetted? I’m sure there’s more than a few folks out there that might get some kicks out of abusing this. But help documentation on the site is, uh, lacking, and I didn’t go poking around the SpotCrime blog to see if they’d addressed this issue. Anyhow, it’s still a pretty nice re-use of government data. Very simple and easy to grasp quickly. Much more user-oriented and immediate that the Ottawa Police’s own crime statistics reporting, which is essentially a set of PDF files (ugh) that list reported crimes by district and month. I wonder how long it’ll take before the Ottawa police decide to collaborate with these folks or someone similar? Would make a lot of sense – they could drop their PDFs and just point folks to SpotCrime or deliver it through their site.